Wayne Rooney's ban means he will miss his team's crucial FA Cup semifinal against Manchester City on April 16. (CNN) -- The two-match ban imposed on Manchester United striker Wayne Rooney for swearing in front of a television camera has been upheld by the English Football Association (FA) after an appeal by the player that the punishment was excessive was rejected. The decision means the England international -- who scored United's only goal in a 1-0 Champions League quarterfinal victory against Chelsea on Wednesday -- will now miss a crunch domestic cup semifinal against city rivals Manchester City on April 16 as well as Saturday's English Premier League clash with Fulham. The ban was initially imposed by the FA after Rooney shouted expletives directly in front of a TV camera during his hat-trick celebration in a 4-2 league win against West Ham last Saturday. The 25-year-old said his outburst had been provoked by "continuous verbal abuse from West Ham supporters." But in an official statement released on Thursday, the FA said: "Rooney had admitted a charge for the use of offensive, insulting and/or abusive language, but claimed that the automatic penalty of two games was clearly excessive. 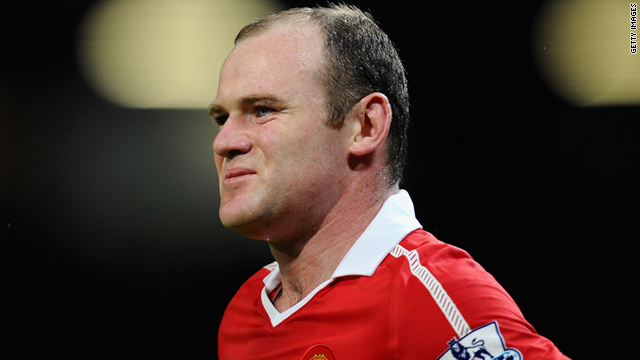 In a statement issued through his spokesman Ian Monk to CNN, Wayne Rooney said he was "gutted" to miss two matches. "I am not the first player to have sworn on TV and I won't be the last," the statement read. I have to accept that what's happened has happened and move on from here. "Unlike others who have been caught swearing on camera, I apologized immediately and yet I am the only person banned for swearing. "That doesn't seem right. I have to accept that what's happened has happened and move on from here," Rooney added. Manchester United also issued a statement on their official website expressing disappointment in the FA's decision to uphold the ban. "The club put forward a very strong case to have the punishment reduced, which was unsuccessful," the statement read. "Wayne Rooney apologized immediately after the match and the club now wishes to move to on to what hopefully will be a very exciting conclusion to the season." The FA's decision came a day after soft drink company Coca-Cola announced they planned to discontinue their $980,000-a-year (£600,000) contract with the footballer. "Our contract with Wayne Rooney came to an end last year and we mutually agreed that we would not renew our relationship. We're really proud of the work we've done with Wayne over the years [and] we wish Wayne well in his career," Coke told CNN in a statement. However, Rooney will be eligible to play in Tuesday's second-leg Champions League quarterfinal against Chelsea at Old Trafford and in the Premier League match against Newcastle on April 19.